PMC - Faisalabad Medical University / Punjab Medical College. 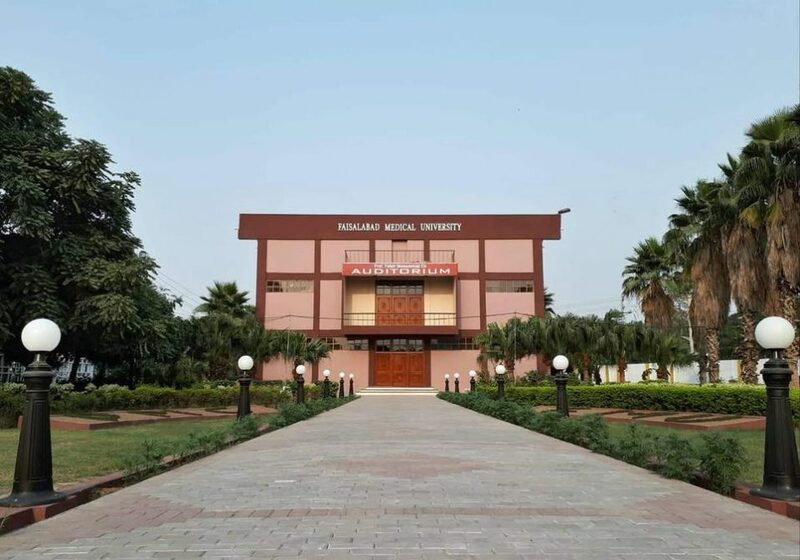 Faisalabad Medical University, also known as Punjab Medical College Faisalabad (PMC), is located in Faisalabad; which is the third largest city of Pakistan. The college has a beautiful campus and has a spread of over an area of 158 acres. The campus is located on Sargodha Road. It was established in 1973. However, the first group of graduates with M.B.B.S degrees finished in 1978. Moreover, the college has recently upgraded to university in May, 2017. The hospitals attached with the university are Allied Hospital, DHQ Hospital and Ghulam Muhammadabad Hospital. The hospitals fulfill the purpose of clinical teachings of the students. PMC is recognized with the General Medical Council (GMC). Moreover, it is listed in the International Medical Education Directory (IMED). Additionally, it is an affiliated institute of University of Health Sciences (UHS). The university campus is large and airy. Also, there are spacious gardens between the departments. There are separate buildings for each department. Moreover, the department building has its own lecture hall. Also, the department building has the tutorial rooms, museums, and practical labs to help the students and teachers. Additionally, the lecture halls as well as auditoriums are fully air-conditioned. There is also a cafeteria for students which serve meals and snacks during the day. If a student wishes to get admission at PMC, then the first step after F.SC or any other equivalent degree is the entry test. The entry test, as directed by PMDC, is MDCAT. Read more details about the MDCAT (MCAT) and admission process. For further information, visit UHS website. Overall, there are 8 basic medical departments in PMC. These are: Anatomy,Physiology , Bio Chemistry, Behavioral Sciences, Pharmacology, Pathology, Forensic Medicine, and Community Medicine. To teach clinical medicine to the students, PMC holds classes in the clinical departments of its affiliated students. So, the departments are: Medical Unit II,Medical Unit III, Medical Unit IV, Medical Unit V, Surgical Unit I, Surgical Unit II, Surgical Unit III, Surgical Unit IV, Surgical Unit V, Ophthalmology, Ear Nose Throat Unit , Ear Nose Throat Unit II, Cardiology, Cardiology DHQ, Oncology, Nephrology, Gynecology & Obs I and II, Gynecology & Obs III, Pediatric Medicine I, Pediatric Medicine II, Pediatric Surgery, Orthopedics, Neurosurgery, Chest, Plastic Surgery,Urology, Dermatology, Anesthesia, Psychiatry, and Radiology. At PMC, BDS class started in January 2009. However, the first batch had a total of 50 students. Dental Section consists of the following departments: Periodontology, Science of Dental Materials, Prosthodontics, Orthodontics, Oral and Maxilofacial Surgery, and Operative Dentistry, Oral Pathology,Oral Medicine, Oral Biology & Tooth Morphology and Community Dentistry. Allied Hospital is a teaching hospital and so, it is attached to Faisalabad Medical University. Students receive most of the clinical education from the hospital. Overall, there are 1150 beds in the hospital, from all the wards combined. In fact, it is the biggest hospital in district Faisalabad and receives the highest number of patients in the whole district. Moreover, the hospital is fully equipped with the latest medical equipments. District Head Quarter hospital is the oldest Government Hospital of the Faisalabad. In addition to Allied Hospital, DHQ hospital also shares the burden of increasing number of medical students and patients with Allied Hospital. Faisalabad Medical University provides the facility of hostels for students. However, there are separate hostels for boys and girls. Each hall has a mess and common room, and a common gym. Moreover, the hospitals have separate hostels for male and female doctors. Male hostel is situated across the Sargodha Road. There are two hostel halls for boys namely Iqbal Hall and Ibn-e-Sina Hall. There are four female halls. The two halls i.e. Fatima and Ayesha halls, mainly house the final year students. These are located adjacent to the Allied Hospital. While Liaquat hall accommodates first and second year students. However, the Jinnah Hall houses 3rd and 4th year students. The hostel gates close by 9 pm and nobody is allowed in or out of the girls’ hostels after this time. The fee of Faisalabad Medical University s decided according to the policy of UHS and government of the Punjab. There is also a library in the campus with reading room having capacity of 20 students. Moreover, there are 2 separate reading rooms having a capacity of 100 students each. However, the reading rooms for boys and girls are separate. The library contains a substantial collection of medical reference books. Additionally, books on literature, arts, novels and religion are also available in the library. The reading room closes at 5PM. UHS has set up a computer lab of 29 computers. Moreover, there are scanners and printers in the computer lab to help students. Within the vicinity of computer lab, students can access free WiFi facility. The facility is available for 24/7. Dr. Najeeb lectures is one of the best choice when it comes to secondary resources for students at PMC. Not only are they popular among medical schools worldwide but also in Pakistan’s. The lectures are video based; and are taught in a very simple way .They work wonders for those who need help in understanding the concepts taught in the college. One can find lectures on all the topics included in Punjab’s medical college curriculum. There are hundreds of lectures, on Gross Anatomy, Neuro-anatomy, Embryology, Histology, Physiology, Biochemistry, Genetics, Pharmacology, Microbiology, Immunology and Pathology, available on his website. You can check more details about the topics by visiting the video library. Students find these videos very useful as they help a lot in comprehending the tough subjects. Also, these video lectures are a great way to ace exams. Moreover, Dr. Najeeb also draws illustrations as the lecture progresses and teaches in a complete classroom-like way. Additionally, students can visit the website drnajeeblectures.com and try a lecture for free before getting a lifetime subscription. Every year, PMC arranges an annual sports activity month. Students participate in sports like table tennis, hockey, cricket, squash etc. The last day of the sports season in Faisalabad Medical University is the annual sports day. On this day, the winners of sports competitions in sports month get their prizes. PMC publishes its annually magazine called “Parwaz”. To learn more about Faisalabad Medical University, visit their official website.